The last several decades have seen unprecedented advances in diagnostics and treatment for vision-threatening eye diseases. Nevertheless by 2020, presbyopia (age-related lens dysfunction, accommodative visual loss) will afflict over 2 billion individuals worldwide. The universal chronic progressive loss of near vision has no prevention; but recent advances in vision correction surgery are providing more and better options for affected individuals. Techniques involving breaking of binocularity and increasing depth of focus have been the primary mechanisms of restoring the ability to see far and near. However, the holy grail of true accommodation remains elusive and is the subject of much research. A fuller understanding of the lenticular biomechanics and wound healing, particularly in relation to intraocular lenses, will be tantamount to our ability to cure this under appreciated medical disease. 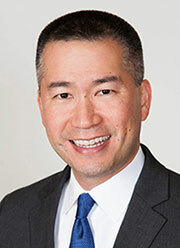 Daniel H. Chang, M.D. is a board certified ophthalmologist who graduated with honors from the California Institute of Technology with a major in Chemistry. He received his medical degree from Duke University School of Medicine. While in medical school, he performed two years of laser vision correction research, which included development of a novel avian corneal model, the use of infrared and ultraviolet free electron lasers, and collaborations across multiple disciplines. Dr. Chang completed his residency in Ophthalmology at Emory University. During residency, he continued his clinical research in the field of vision correction. Additionally, his clinical and surgical performance earned him the title of Chief Resident. Following residency, Dr. Chang completed the prestigious cornea and refractive surgery fellowship at Minnesota Eye Consultants, focusing on the surgical correction of vision. Dr. Chang has authored numerous articles and publications on lasers, refractive surgery, and advanced intraocular lenses. He has been principal investigator on dozens of Phase III and Phase IV FDA clinical trials, including several that have brought new intraocular lenses and surgical devices to market in the United States. He regularly lectures at educational and professional meetings from the local through the international level, and he trains and advises other surgeons from the around the world on vision correction technology. Dr. Chang has performed thousands of successful LASIK, PRK, cataract, and corneal procedures. Dr. Chang is a volunteer surgeon and a founding member on the board of directors for Advanced Center for Eyecare, a non-profit clinic that provides medical and surgical care to the uninsured and underinsured people in Central California.